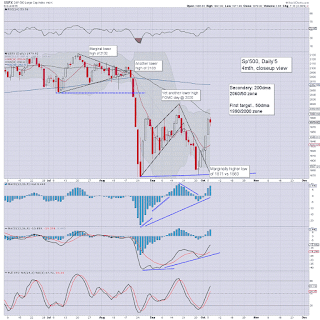 With equity indexes closing broadly higher, the VIX was lower for the seventh consecutive day, settling -5.2% @ 18.39. 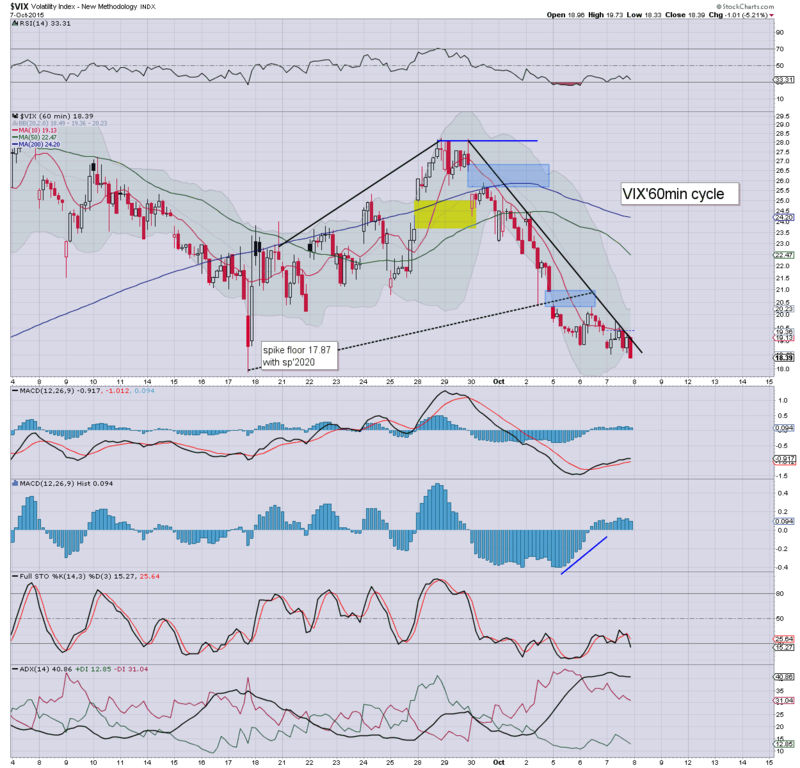 Near term outlook threatens the sp'1950s.. but more broadly.. the 2040/60 zone, which would equate to VIX in the mid/low teens. VIX remains very subdued, the 17/16s will be due tomorrow, if sp'2000/2010. 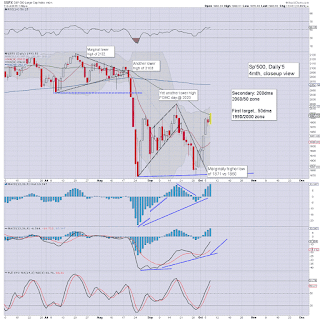 By end of next week, if sp'2040/60 zone... then VIX 14/13s. Sustained action <13 looks unlikely. *closing hour action: further chop, but with renewed upside into the close... absolutely nothing for the equity bears to pleased about. So.. a bit of a messy day in market land.. but broadly.. another day for the bull maniacs. Clearly though.. there are distinct areas of weakness out there.. in the same stocks that were warning of trouble in early August. Regardless of any weakness/retrace.. the sp'2040/60 zone still looks probable before next opportunity of major down wave. US equity indexes are set for net daily gains, but price action sure is choppy... and there remains threat of a retrace to the sp'1950s.. before the next attempt to break back above the psy' level of 2000. 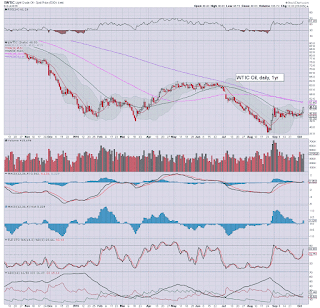 There is renewed weakness in Oil, -1.8% in the $47s.. having hit $49.71. *Oil is a curious one, as if it can break >$50... there is a clear 5/7$ higher.. within the very near term, and that would be the perfect excuse for sp'2040/60 zone. 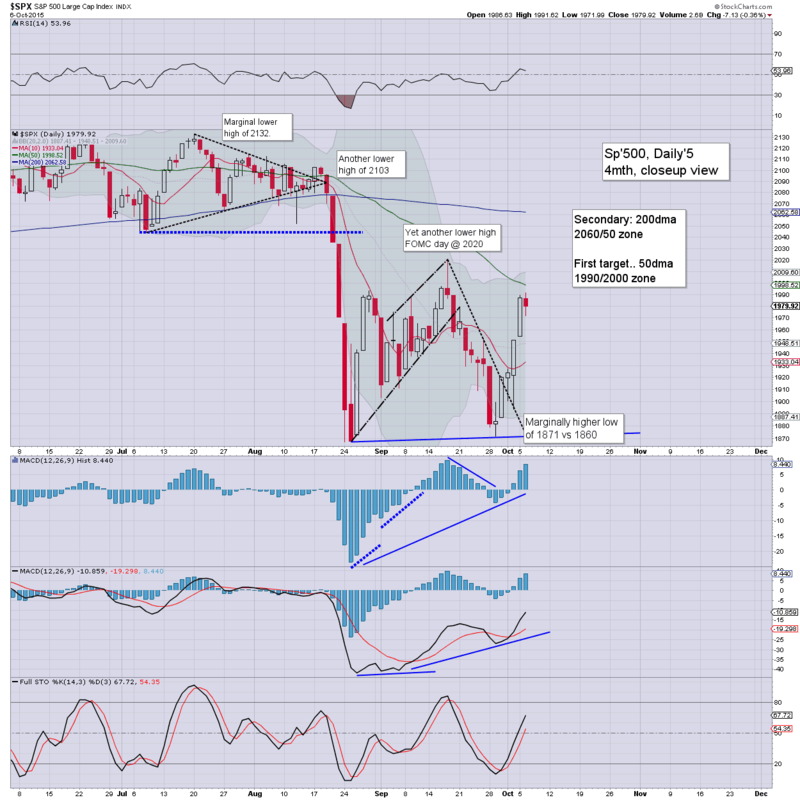 On balance, we look set for net daily gains... with VIX set to close lower for the 7th day.. in the 18s. 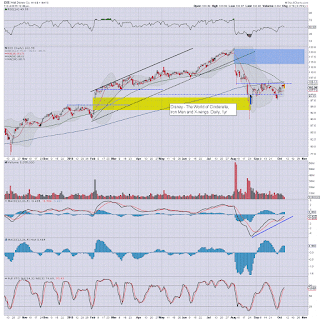 notable weakness: FB, -1.2%.. along with most other momo stocks. 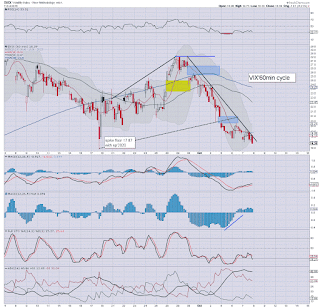 There sure is weakness out there.. despite the broader gains. It remains a real messy day in market land.. with the sp' swinging from a low of 1976 back into the 1990s. Is a daily close in the 2000s going to be the outcome? 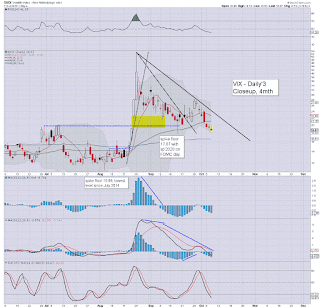 VIX is naturally back negative.. and looks broadly headed to the mid teens by next weeks opex. Without question.. a real mess of a day. A daily close in the sp'2000s would really rub it in the faces of the bears today. notable strength: FCX +9.7%... as chatter increases online about the stock.. not least with Icahn involved. 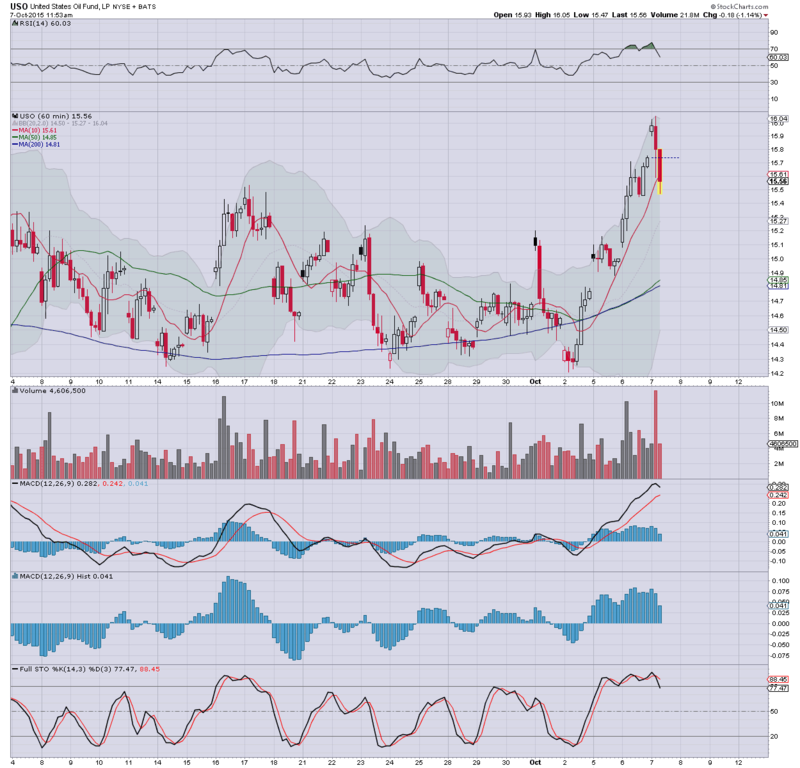 weakness: momo stocks.. TSLA, -3.3%.... having briefly taken out the 200dma earlier. 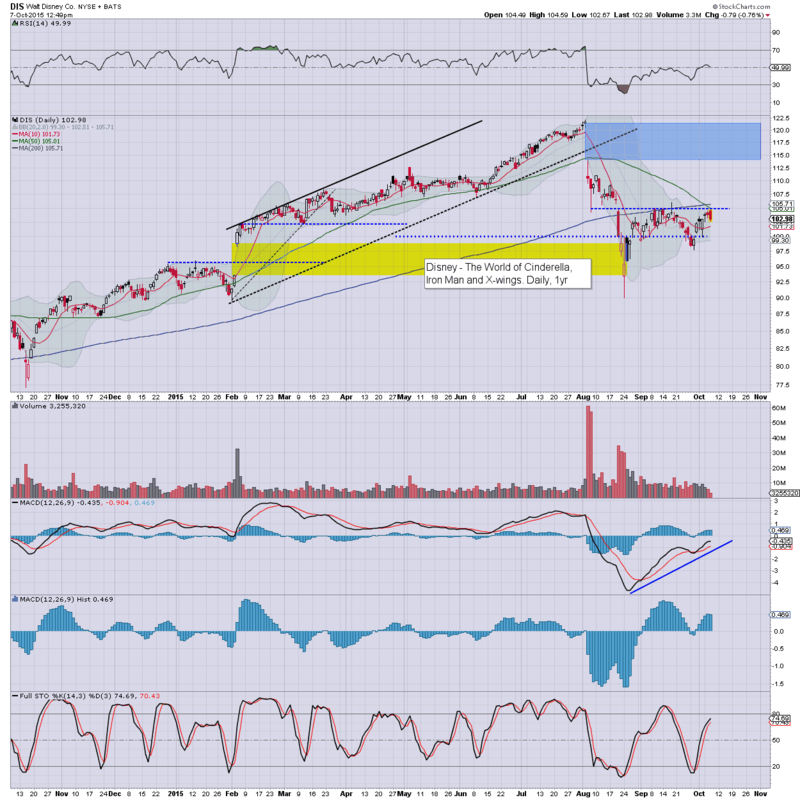 Whilst the main indexes continue to see some moderate chop around sp'1980.... two stocks - AAPL and DIS, are giving serious warnings that the market might be close.. or has even maxed out. Both lead the way lower in August... and today are notably lower by -1.5% and -1.0% respectively. For this hour.. I wanted to highlight what were two of the stocks that gave some of the early warnings in August. 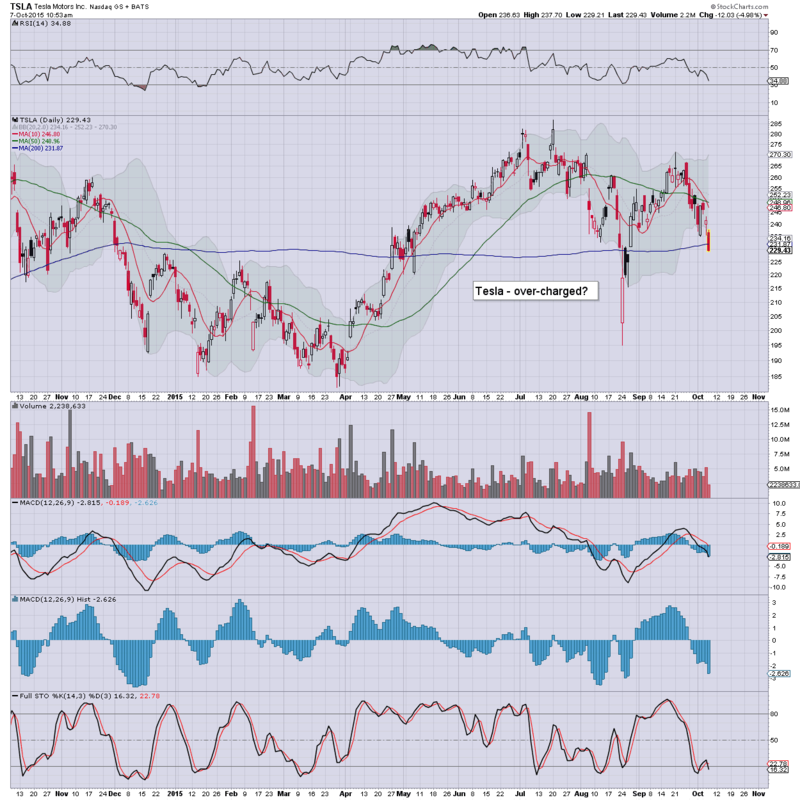 Both AAPL and DIS have been unable to re-take old support.. including the 50/200dmas. 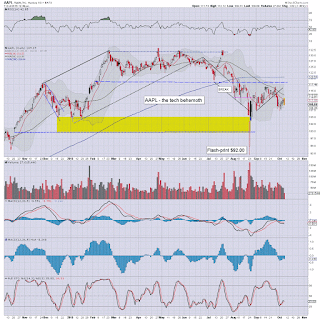 Price structure on AAPL is a clear bear flag.. and today's candle sure ain't pretty. *for now.. 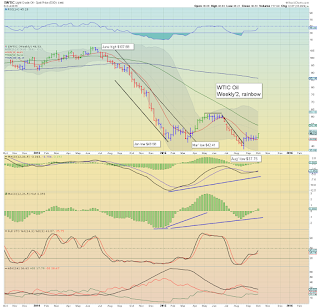 I am NOT chasing lower.... but that DIS MACD (blue bar histogram) cycle IS ticking lower. ... its not to be taken lightly. It has been a bit of a mess this morning, with the sp' swinging from an early high of 1999 to 1976. 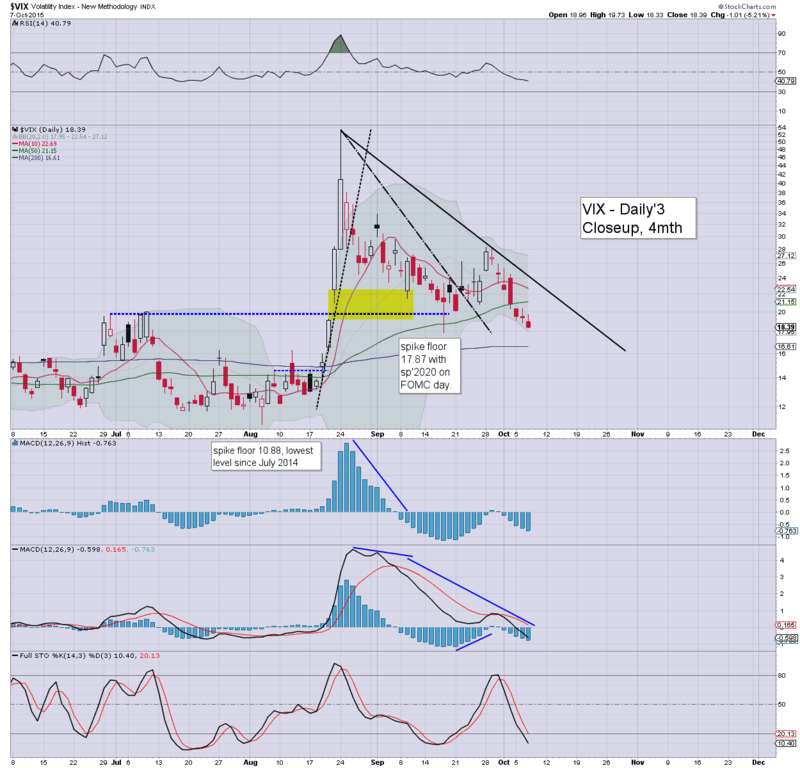 The VIX has naturally turned positive, clawing from a new cycle low of 18.53 to 19.73. 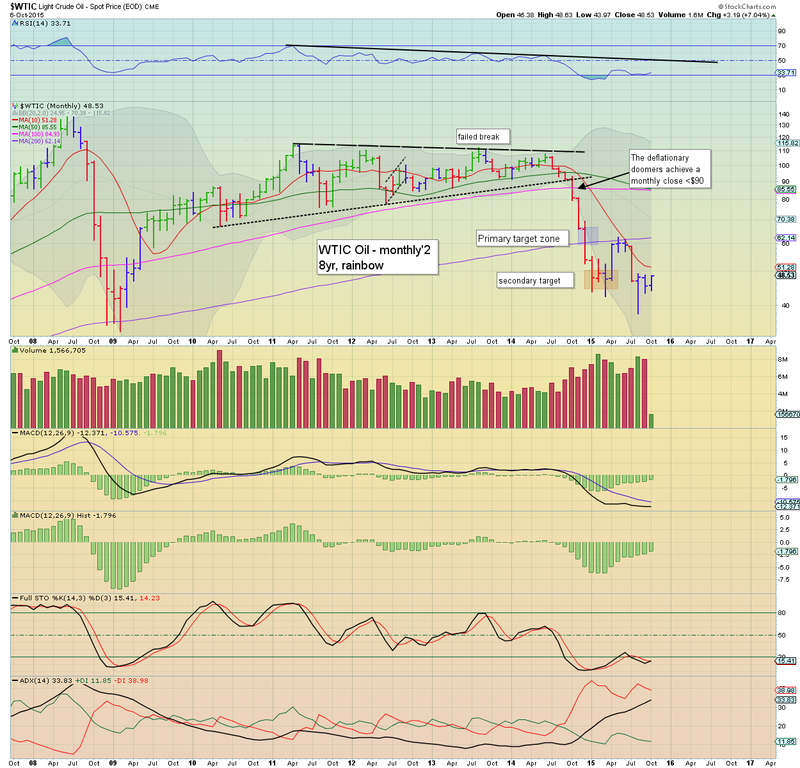 With Oil -1.2%, the market is again vulnerable to the sp'1950s... this afternoon could be rather interesting. So.. with a failure to clear the psy' level of 2K.. and Oil turning lower, the market is under some pressure. Once again, the natural retrace low would be somewhere in the sp'1950s... which considering this mornings' reversal.. seems possible this afternoon. Broadly though... upside into next week still looks due.... to the 2040/60 zone. DIS -1.0%.. and that is with indexes broadly flat. I'll certainly look to catch them once the broader market appears maxed out.. but right now, I'm guessing that won't be until late next week. With a weekly net surplus of 3.1 million barrels, Oil has seen a rather strong reversal, although cyclically it was due to retrace. Equities have naturally been affected a little, with the sp' cooling from 1999 to 1985. 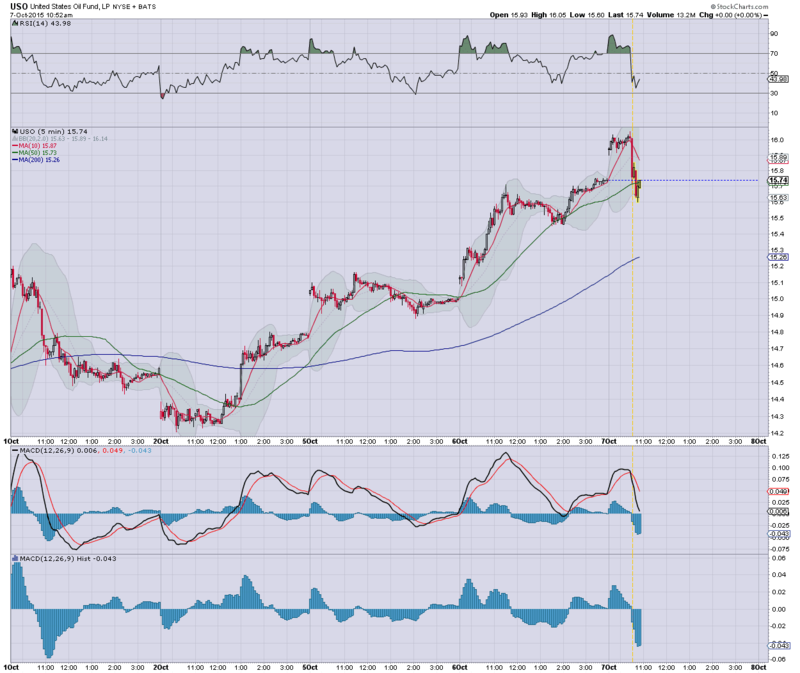 With the USD +0.1%.. Gold is under a little pressure, -$2 @ $1144. You can see how the 5min cycle was on the high side prior to the EIA number. 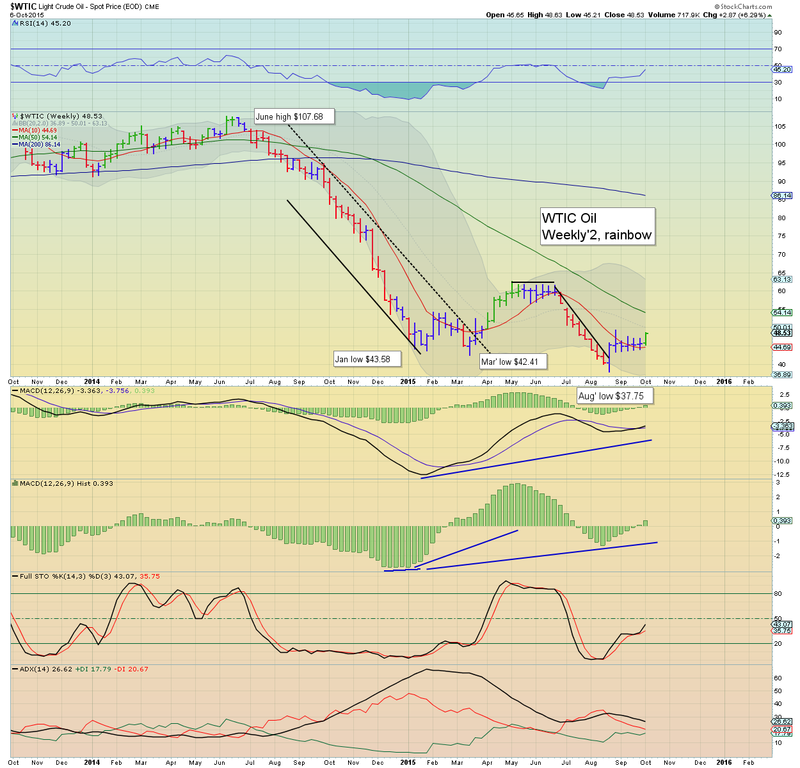 Broadly though... Oil still looks outright bullish on the bigger daily/weekly cycle. Again, if I 'had to' take an Oil trade, it'd be long.. from this afternoon... but for now.. I'm not particularly interested. .. relative to the main market.. this is one ugly performance. 11.16am.. What a mind frak.... swinging from 1999 to 1981.. and now the 1950s are back on the menu. I can only imagine some bears were short stopped at the open.. and now throwing bricks at their screen as the indexes are turning red. 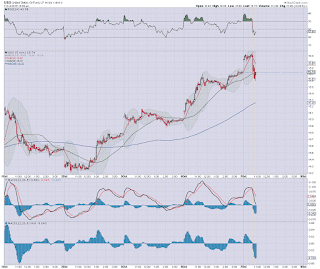 11.20am.. notable weakness.. AAPL -1.3% in the $109s..
11.28am.. sp -3pts.. 1977.. a sig' down swing of 22pts.. and its not even 12pm yet. 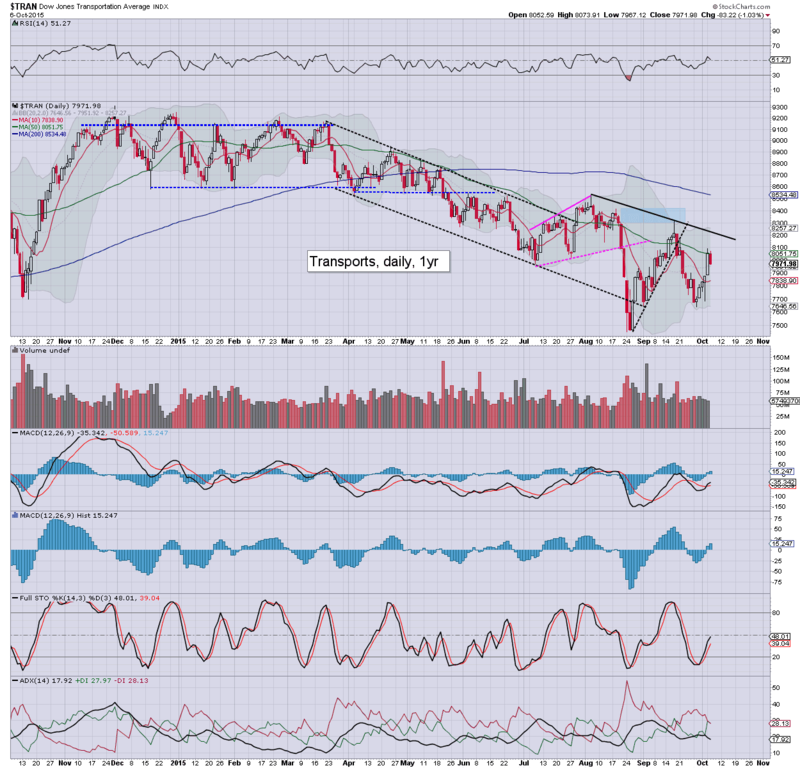 A daily close in the 1950s to spook the weaker bulls? Oil, -1%... is not helping! 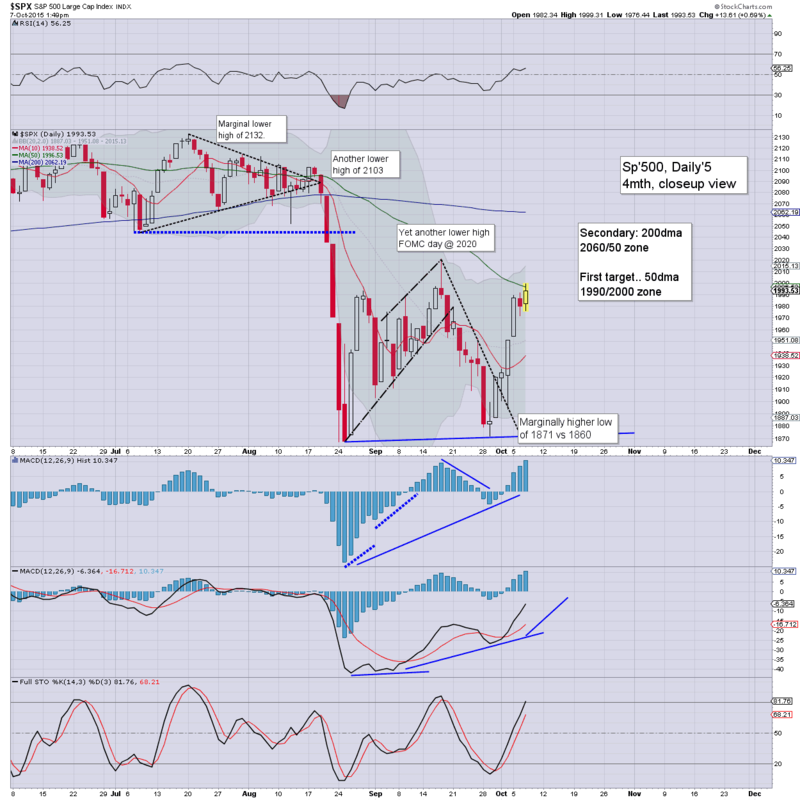 US equities open moderately higher, with the sp'500 set to break into the 2000s today. First key resistance on the hourly/daily cycles is 2015... and by this Friday that will be around 2020/25. 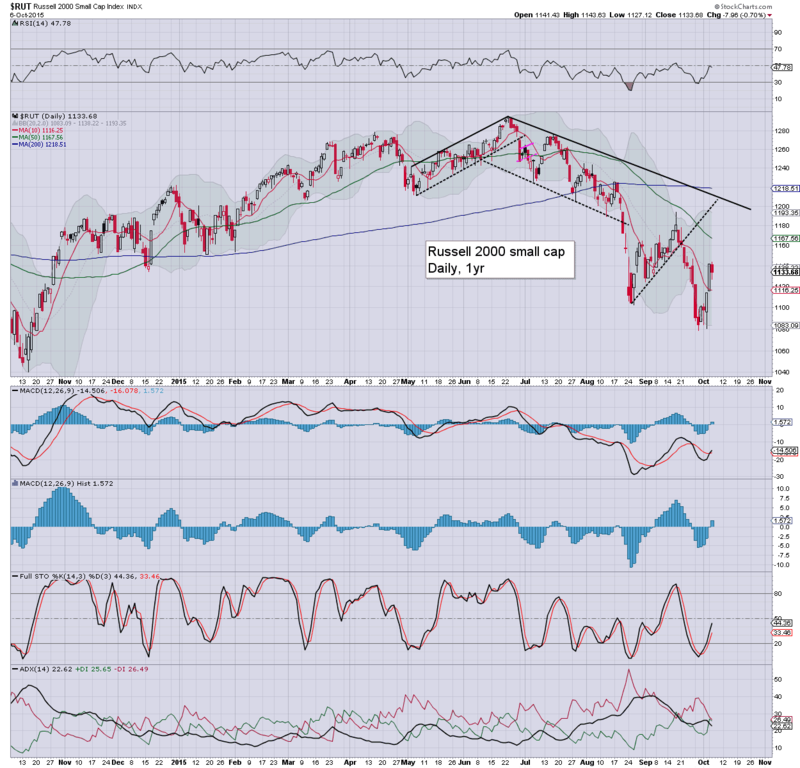 A test of the 200dma in the 2050/60s looks increasingly probable. *a clear fail of yesterday's baby bear flag. I'm not sure how some of you wave counters would now redefine everything from last Friday, but clearly.. we're headed UP. So.. opening gains, and it looks like we'll break into the sp'2000s today. For now, this is once again a juggernaut of a market.. as the bears are being systematically ground out. 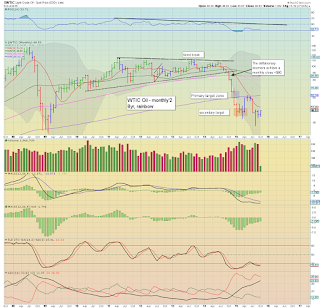 Again.. the ultimate issue is can the market retake the monthly 10MAs... Dow >17400.. with sp >2050. I'm guessing no... but that issue will (obviously) be more important at end month. notable strength: FCX, +7.4%... as the chasers are starting to get involved. 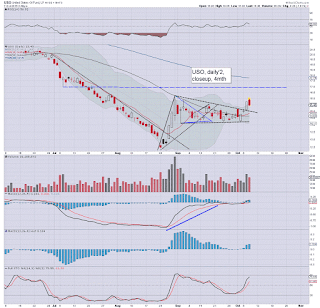 Fellow copper miner.. TCK +20%.. but then $7 remains a 'destroyed level', relative to last year. *eyes on the EIA oil report.. due 10.30am... if market likes the number... Oil will be testing $50.. and that sure will help give an sp' daily close in the 2000s. Head cheerleader on CNBC - Sara Eisen, is visibly exbulient as there is an IPO at the NYSE. 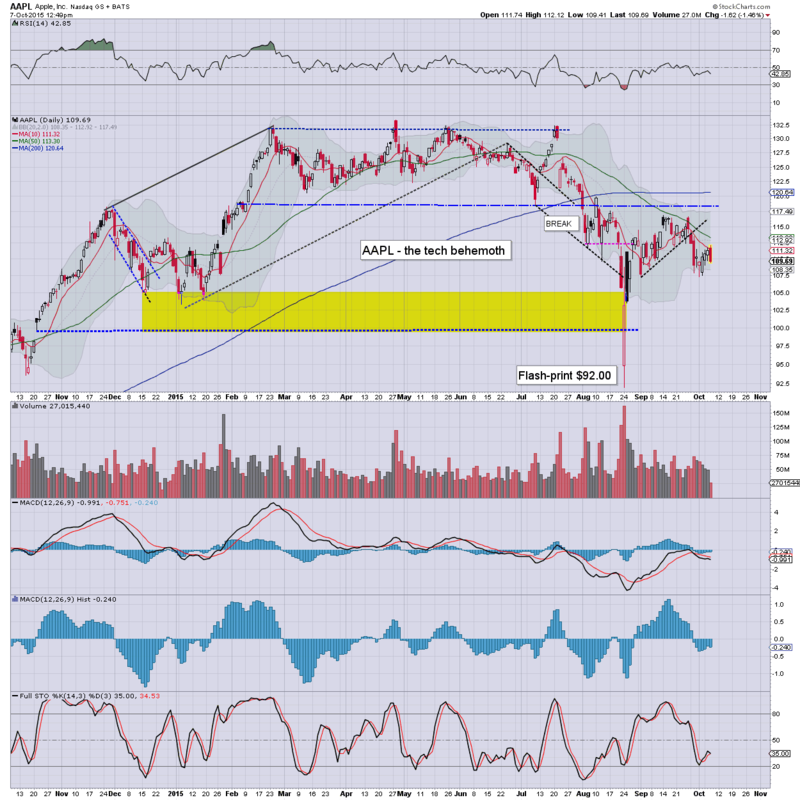 notable weakness, AAPL, -0.3%... which is really lousy performance relative to main market. 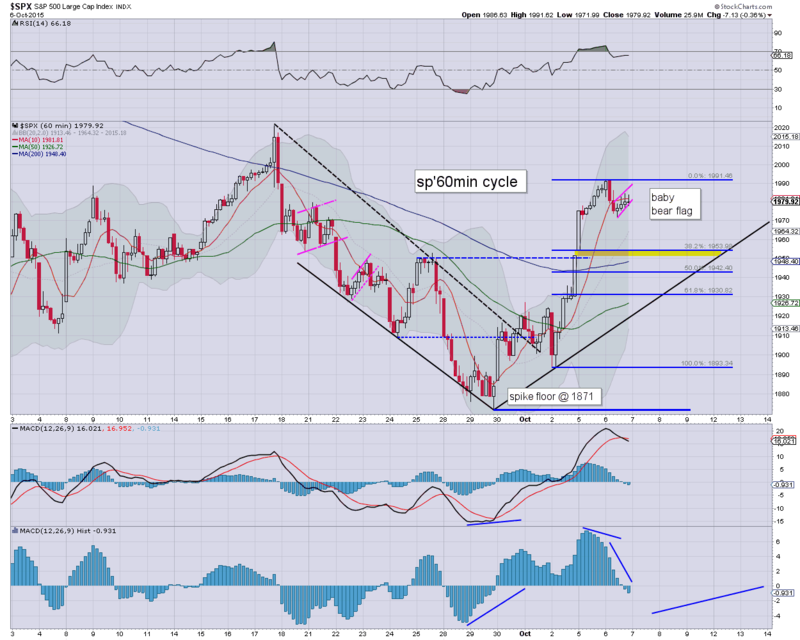 It bodes good for the AAPL-bears in the next down cycle. 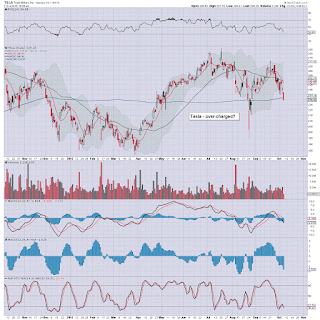 10.27am.. another notable loser.. TSLA -4% in the $231s.... not great. 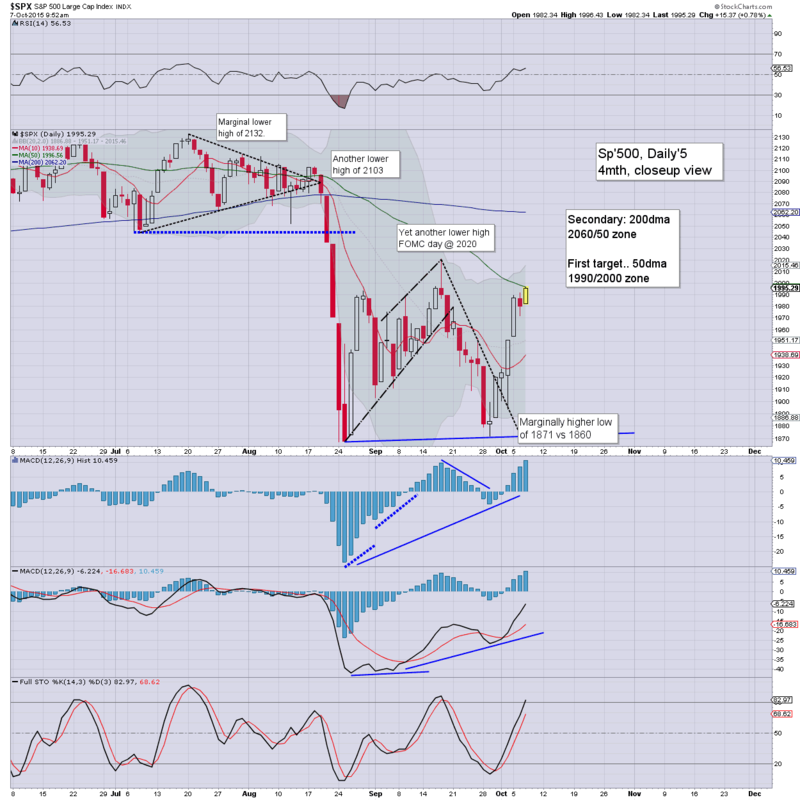 Equities still looking on track for sp'2000 today. So, opening gains are due.. and considering the Tuesday weakness/price structure, I'm kinda surprised. New cycle highs look due this morning... and clearly.. first target will be the big sp'2000 threshold... where the 50dma is lurking (although the Dow/Trans... already broke that yesterday). 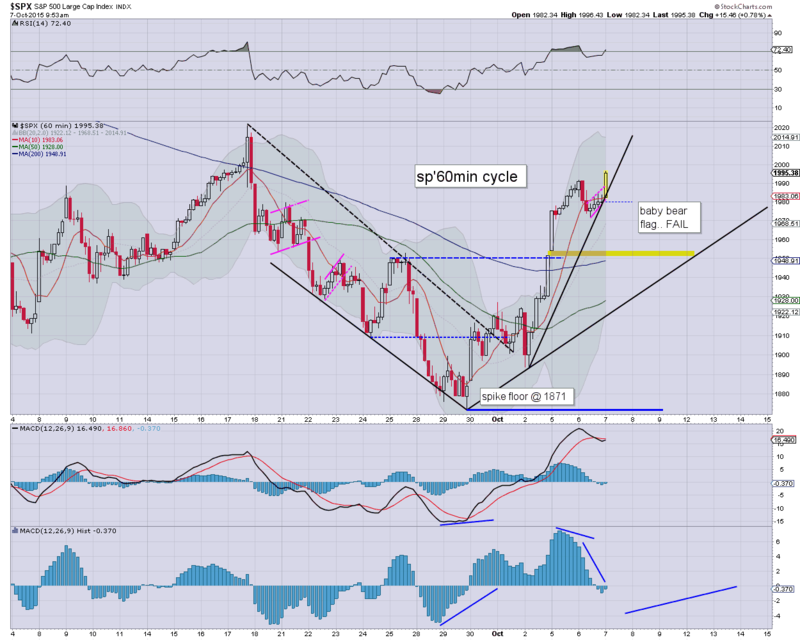 I realise a few are looking for a cycle peak this Thurs/Friday... but that won't be enough time to hit the 2040/60 zone... which would be the more logical back test of old broken support from August. Maybe this madness can level out by next Friday's opex. For now, I'm in no hurry to attempt another short... not least with the daily MACD cycles as they are... accelerating to the upside. Japan, a lot of chop, settling +0.7% @ 18322. China.. remains closed. I guess they open this night. *eyes on Oil today. If the EIA oil report pleases the market... the $50 threshold will on the menu.... and that will help the broader market mood. How high could Oil go? 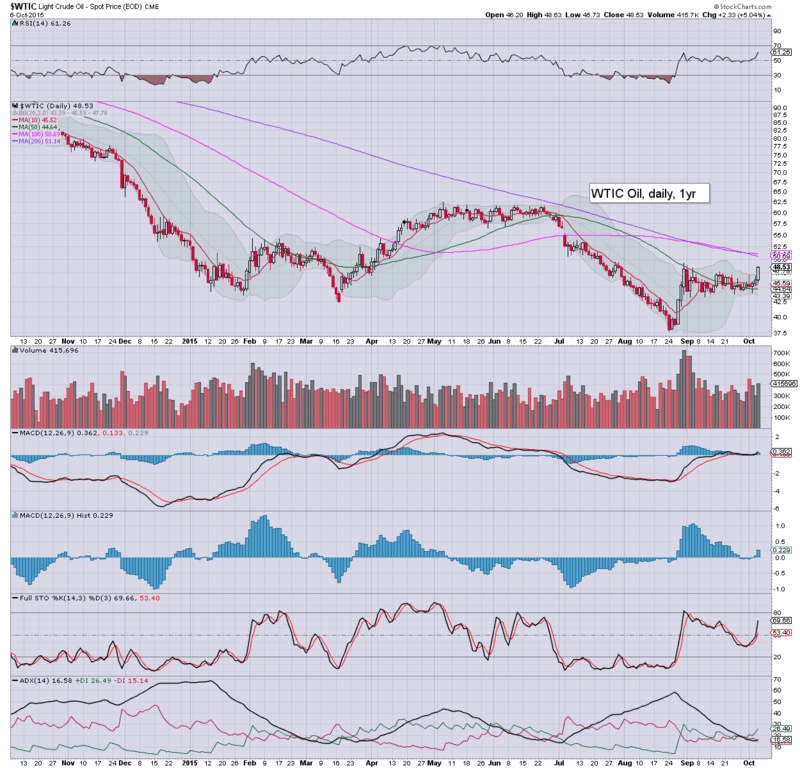 Whilst equities saw a new cycle high of sp'1991.. and settling @ 1979, there was far more notable action in WTIC oil, which settled higher by $2.33 (5.0%) @ $48.53. Price action has been increasingly tight lately, but appears to again be trying to confirm a bullish pennant.. with viable upside into the mid 50s. 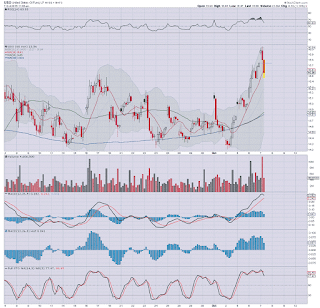 *a VERY notable green candle on the weekly chart.. the first since mid May. 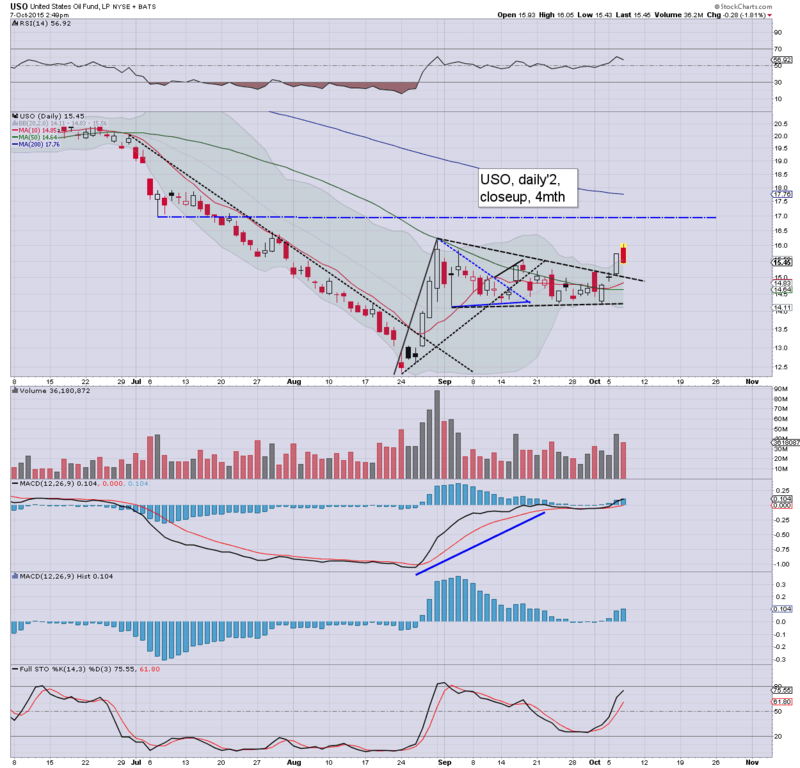 Price structure across the last 5 weeks or so is a bullish pennant, with today's move a possible early phase breakout. First upside target will be the psy' level of $50. If that is broken and held over.. then next target will be the 55/57 zone.. where there is a legacy price gap. To be clear though.. supply remains an issue.. and with a relatively weak global economy.. there are also demand issues. I don't see sustained price action >$60 for the remainder of this year... or even for most of next year. The wild card (in terms of possible hyper upside) is the middle east.. not least Syria and Iran.. but then.. isn't that always the case? *If I 'had to' take a trade in Oil, I'd be long.... not least as the USD is currently threatening renewed downside to the DXY 90 threshold. Wed' will see the latest EIA oil report.. and consumer credit. A pretty standard advert for Payday loan company 'Wonga'. The APR was a mere 1506%. What a bargain huh? It must be a sign that the UK economy is doing great.. as this company continues to increase loans to those of the lowest financial strata. I'm not sure if those of you in the USA also have similar advertisements on mainstream TV in the evening, but here.. its pretty standard now. Frankly, I find it gods damn sickening, but then.. if you believe in choice - as I do, I'd not have any restrictions. What happens when the next financial crisis/recession hits? 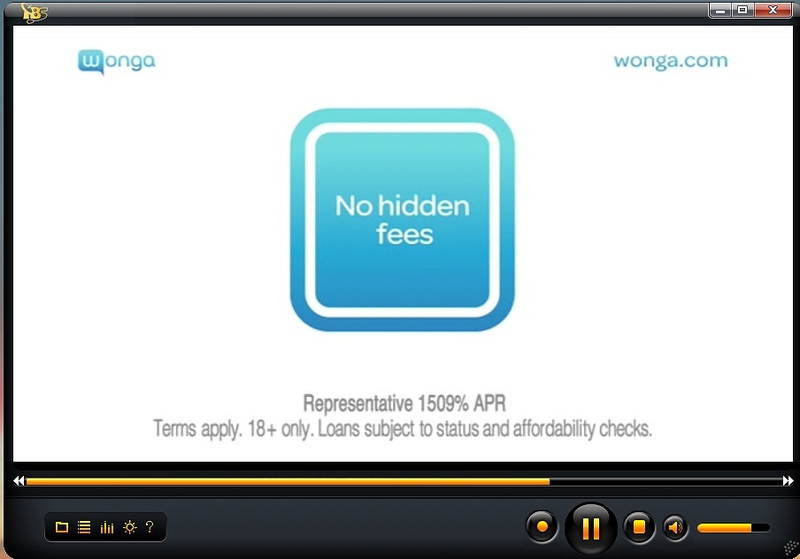 I guess that would be even more bullish for the loan sharks? 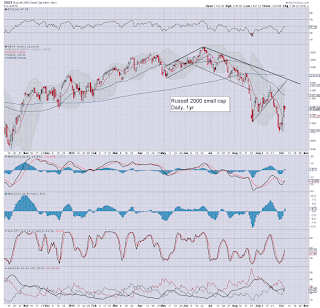 US equities closed broadly weak, sp -7pts @ 1979 (intra high 1991). The two leaders - Trans/R2K, settled lower by -1.0% and -0.7% respectively. Near term outlook offers further opportunity of another moderate wave lower to the sp'1950s, but broadly.. the 2000s look a given next week. 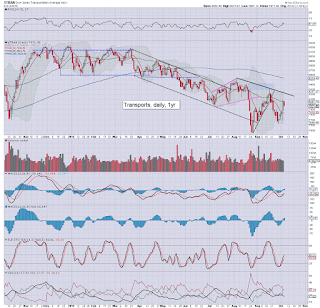 Despite a sig' net daily decline the Trans - arguably mostly due to higher Oil, most indexes are holding together very well. 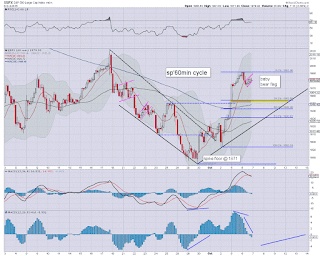 Best guess.. a further moderate wave lower to the sp'1950s... fill the price gap.... 38% fib retrace.. and then up to the sp'2000 threshold next week.